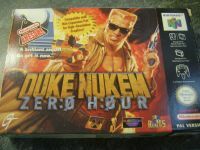 "uke Nukem: Zero Hour is a third-person shooter video game in the Duke Nukem series, developed by Eurocom for the Nintendo 64. The game uses a relatively large 32 megabyte cartridge and could also utilize the Expansion Pak to allow for better graphics but slowing down the frame rate. It has a 4 player split-screen multiplayer mode that uses a first-person view. The plot revolves around time travelling aliens attempting to alter the course of history and eliminate Duke's ancestors. Locations, weapons, items, and clothing are relevant to the time period Duke is in. The game has an opening intro that explains the concept of the plot. The game also has many mature plot elements. In one stage, Duke time-travels to the Victorian Era and finds the still-fresh murder scene of Mary Jane Kelly. She had been slain at her residence of 13 Miller's Court on November 9, 1888 by Jack the Ripper. In another, Duke must travel through a New York devastated by atomic warfare." Source: Wikipedia, "Duke Nukem: Zero Hour", available under the CC-BY-SA License.